The ultimate smart grid provides integrated automation, communication and control of the entire electric system from generating plants to the operation of electric equipment inside homes, commercial buildings and industrial plants. Distributed energy resources such as combined heat and power systems and photovoltaic systems are part of the smart grid as are energy storage devices such as cool storage and electric vehicles. The most important smart grid options for most electric cooperatives and public utilities are associated with the distribution system from substations, through feeders, transformers, meters and into customer premises. The Consortium's Smart Grid Investment Model (SGIM)TM focuses on these substation-to-customer smart grid applications along with the communications, IT and management requirements needed to support successful smart grid applications. Evaluating the business case for these smart grid investments at each utility is difficult. Large up-front costs are required with benefit streams that are uncertain and typically require many years to pay for the initial investments. A variety of technologies can be applied to achieve smart grid objectives and some technologies provide benefits for more than one smart grid program (e.g., voltage information from AMI/smart meters as end-points in conservation voltage regulation). The impact of in-premise technologies and customer programs such as programmable communicating thermostats with incentive pricing are an essential component in providing financial benefits for many utility smart grid strategies; however, customer program participation and response are uncertain. Furthermore, most utilities do not have customer-class end-use (e.g., residential air conditioning) load profiles required to assess these benefits at various participation levels. These and many other issues provide challenges in applying formal financial analysis of smart grid investments. A 2010 nation-wide survey conducted by the Smart Grid Consortium found that only about 10% of utilities have applied formal financial analysis to their smart grid planning with even fewer applying comprehensive analysis across the entire distribution system. Without formal, comprehensive cost/benefit analysis, it is difficult to develop a smart grid strategy that recognizes individual utility characteristics. Utilities are left to evaluate individual technology applications without considering synergies and scale economies while the impacts of important customer-related issues such as program participation are not addressed. While vendors often assist utilities with financial analysis, focusing only on vendor technologies does not cover the entire substation-to-customer scope required to develop comprehensive smart grid strategies. 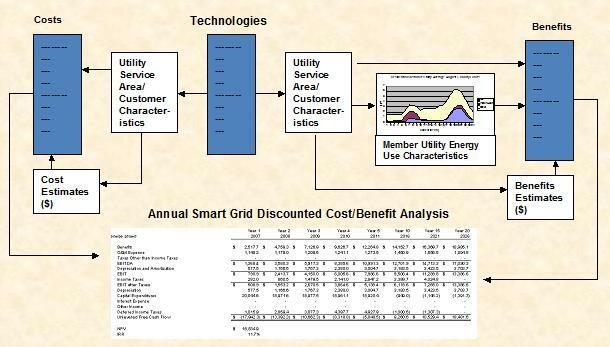 The lack of publicly available, independent, objective and comprehensive smart grid financial cost benefit financial models applicable to individual electric coops and public utilities provided the motivation to develop the Smart Grid Investment Model (SGIM)TM to provide the formal, comprehensive cost/benefit framework required to evaluate smart grid investments across the entire utility distribution spectrum. The SGIM is implemented and applied for each individual utility client. 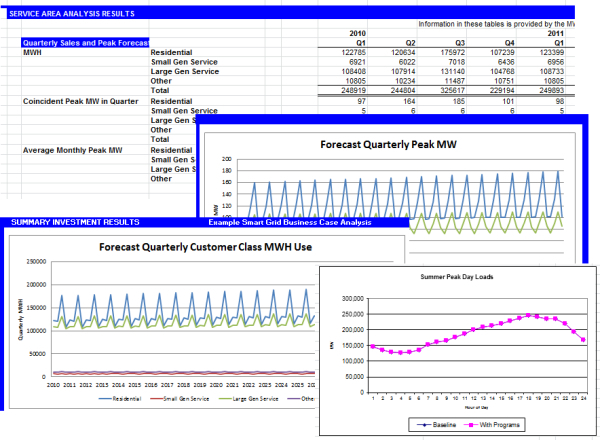 Each model reflects the utility's current infrastructure, customers, monthly kWh, monthly peak kW and monthly hourly loads by customer class and end-use (e.g., residential air conditioning) as well as monthly forecasting models that determine impacts of smart grid programs on kWh, peak kW and hourly loads over the 20 year analysis horizon. The model also incorporates communications, IT, metering, distribution automation including conservation voltage reduction (CVR), customer engagement including demand response, pricing programs and in-premise technologies and other smart grid initiatives. See more details on the SG Investment Model. The remainder of this web page presents a few highlights of a smart grid business case analysis for a representative utility. While differences in customer characteristics, load profiles, avoided power costs and other factors make each utility's smart grid cost and benefit analysis results unique, the same quantitative process is applied in each case. This process is illustrated with the schematic below which shows a technology/program-based approach where costs and benefits are determined for each smart grid option including impacts on customer-class, end-use load profiles which determine avoided power and capacity investment costs. The Smart Grid Investment Model (SGIM)TM is implemented for each utility with initial investment parameters developed by Consortium staff. Each smart grid option is evaluated by checking the appropriate box on the GATEWAY worksheet shown below for an example municipal utility considering smart electric and water meters. 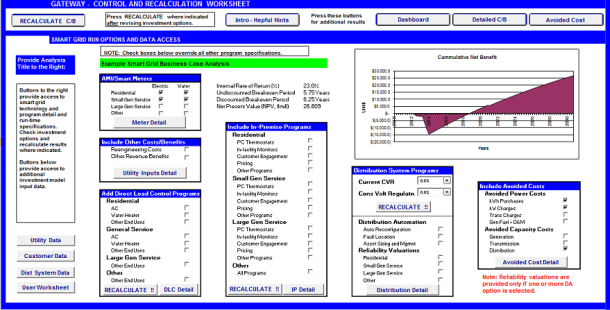 In addition to providing access to all smart grid programs and program parameters, the GATEWAY worksheet provides selected summary cost/benefit analysis results including internal rate of return (IRR), undiscounted breakeven period, discounted breakeven period and the net present value (NPV). The undiscounted breakeven period is equivalent to the simple payback and the discounted breakeven is equivalent to the discounted payback (where future values are discounted to reflect the fact that future income or expenses have a smaller value than current income and expenses). The cumulative net benefit chart (sum of all benefits minus sum of all costs at each quarter) is displayed with the point at which the curve crosses the X-axis corresponding to the discounted payback period. 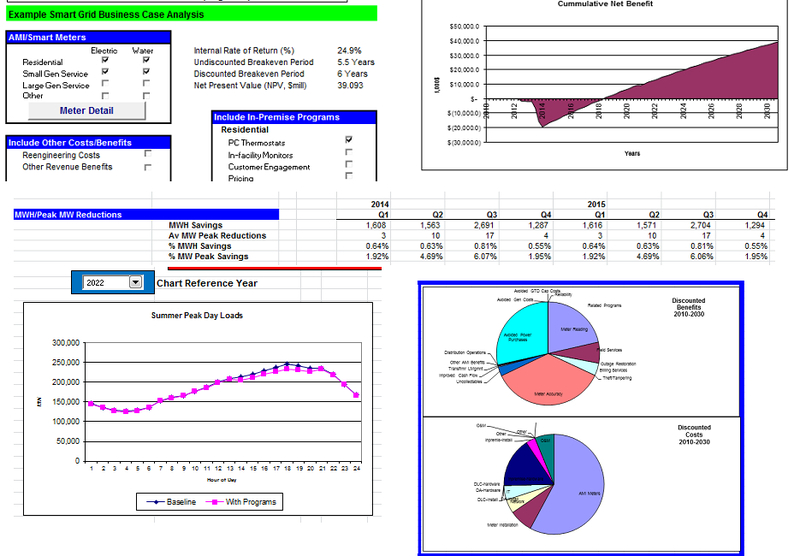 Detailed cost/benefit analysis results are presented in the DASHBOARD and C-B Results and other worksheets, some of which are shown below. Parameters applied in the analysis can be reviewed by clicking on appropriate buttons. For example clicking on the "Meter Detail" button in the DASHBOARD (screen above) reveals the program participation assumptions used in the analysis. 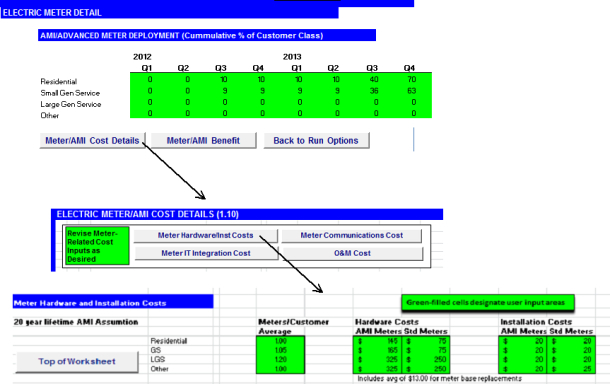 Clicking further on electric meter "Meter/AMI Cost Details" button provides options for examining meter hardware installation costs, IT, Communications and O&M cost inputs. These button options and corresponding data entry items are illustrated below. Sensitivity analysis can be conducted by revising the various parameters to see how an increase or decrease in the cost of meters, communications or other system components affects the financial analysis outcomes. AMI/Smart Meters are just one area of potential smart grid investments. An additional opportunity, after the implementation of AMI is in the customer engagement area. Programmable communicating thermostats (PCT) can be used with an AMI/Smart meter system to provide demand response, a reduction in peak period hourly loads through automated and voluntary thermostat reductions. Checking the Residential/PC Thermostats option and clicking the RECALCULATE button turns that option "on" and forecasts impacts on peak period hourly loads, avoided power costs and delayed capital investments. The PCT program has increased the IRR to 24.9% and reduced the discounted payback (breakeven) to 6 years. Other impacts of the program are shown in the figure below including a reduction in peak hour loads of about 6% with a per-unit PCT cost of about $465. The results presented in this screen reflect a program participation of about 20% of customers with central air conditioners. As an alternative to an AMI/Smart meter/PCT, a utility might want to consider implementing a PCT/direct water heating load control system with its own communications system for a cost of about $750/unit. The figure below shows results for this alternative. The IRR is smaller and the discounted payback is longer at 7 years; however, the cost of this less extensive system is $11.2 million rather than $30.9 million for this example utility. A quantitative, comprehensive model that will be maintained continuously into the future, at the ready to address new smart grid investment options without having to "reinvent the wheel"
The Smart Grid Investment Model (SGIM) applied in each SGRC smart grid analysis provides the most comprehensive reliable financial analysis of smart grid investments. 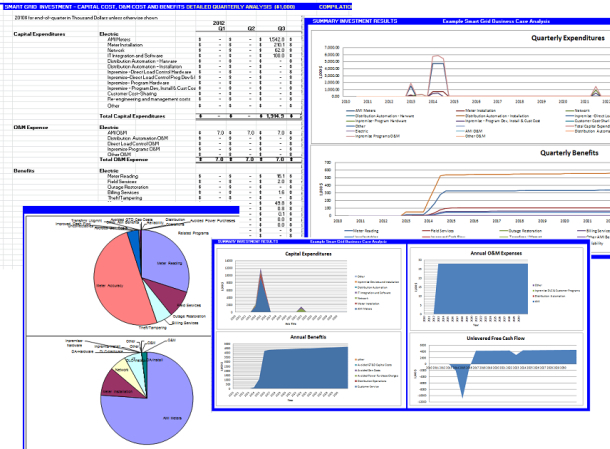 The utility-specific nature of each application ensures that investment analysis reflects each utility's existing infrastructure, customer characteristics, hourly systems loads and management objectives. SGRC maintenance of each utility's SGIM ensures the ability to revisit investment decisions into the future without having to "reinvent the wheel," saving time, money and providing a superior financial analysis.